There might come a time when you find yourself not wanting to return to work after having a baby. Maybe you might even be thinking about being a full-time mom a few weeks before giving birth to your baby. You want to make sure that you have your priorities set. In this stage of your life, you might be thinking about putting a lot of your attention on your newborn child. If you are thinking about leaving the workforce before or after childbirth, that is totally okay. You are absolutely not alone on this journey as a lot of soon-to-be mothers go through this dilemma as well. If you have properly weighed out the pros and cons about leaving your job and have come to the conclusion that you will be leaving your job, you have to properly let your employer know that you will be leaving. 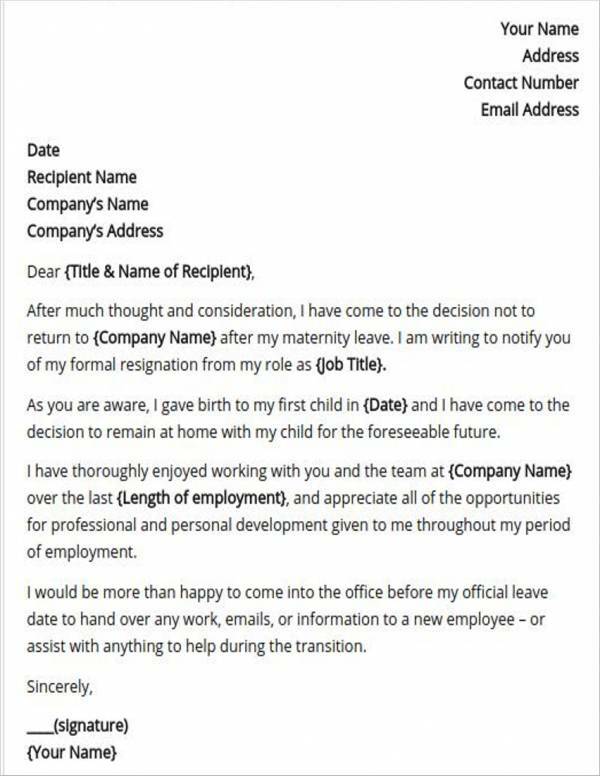 You can do this by handing in a pregnancy resignation letter that outlines the details about why you need to leave your job. 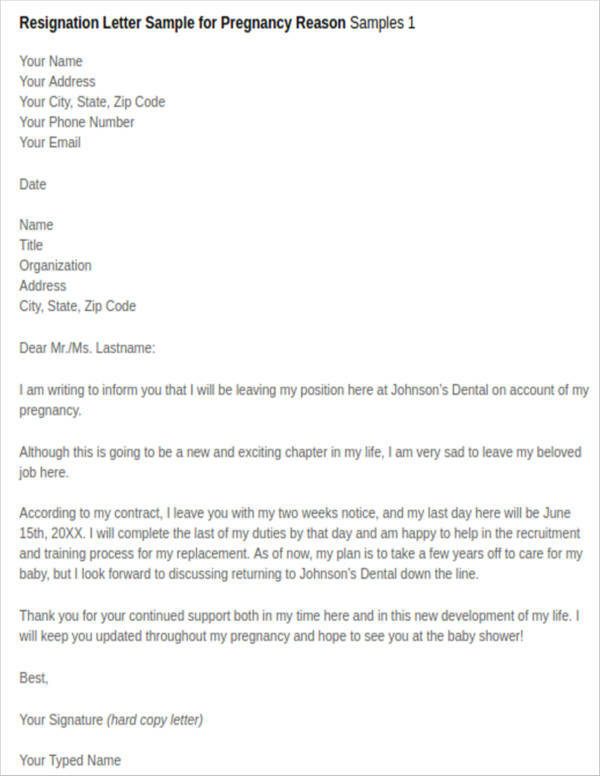 If you are leaving your job due to pregnancy for the first time or if you need a little bit of guidance about writing a pregnancy resignation letter, we are here to help you out. In this very article, we will give a few tips that you can use once you begin drafting your job resignation letter. Just keep reading this and you will have a better grasp as to what maternity resignation letters look like and what the content should be. Parenthood can be quite a job. It can take a toll on you and can leave you with restless and endless sleepless nights. You have to think about whether you will be able to balance parenthood with your regular job. You want to carefully assess everything and see what would work best for you and for your newborn child. If you do decide to leave your job while you are still on maternity leave, it can be a bit of a challenge since you are not in the office and talking to your employer or supervisor in person is a quite not possible at the moment. Due to this circumstance, you can send a two-week notice email or you may also opt to send your notice via mail. You may also tell your boss that you are leaving via the telephone. After notifying your boss about your plans to leave the workforce, you can now start giving them your resignation. Although your notice is already a sign that you are resigning from the company, a resignation letter serves as a means of formality. You want to avoid burning bridges and jeopardizing the relationship that you currently have with your employers. You might feel confident that you do not want to return to your job now but a few circumstances might change and you rethink your company resignation from the company. To make your work resignation letter a little more effective, you have to ensure that you follow a formal format. So what should the format of your letter be? It should have a formal heading and should also have a formal cover letter salutation to go with the formal format that you are following. 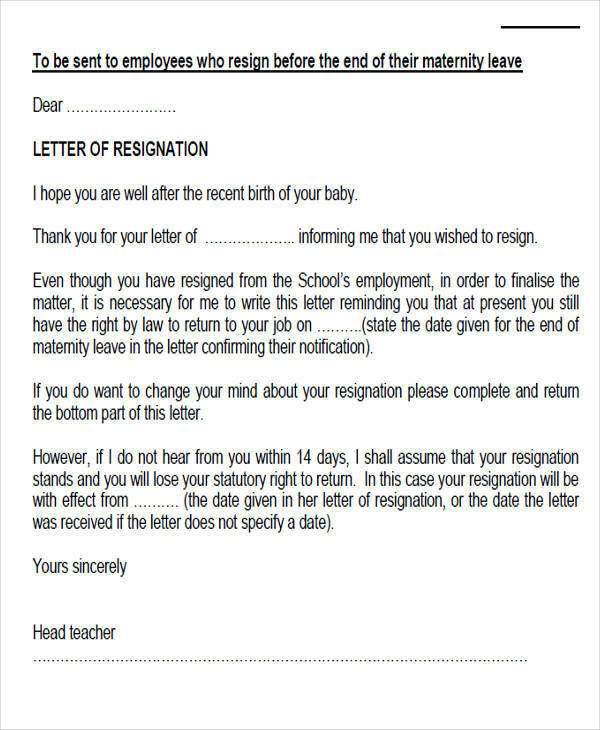 In the firsts part of the letter, establish that what you are writing is indeed a resignation letter. 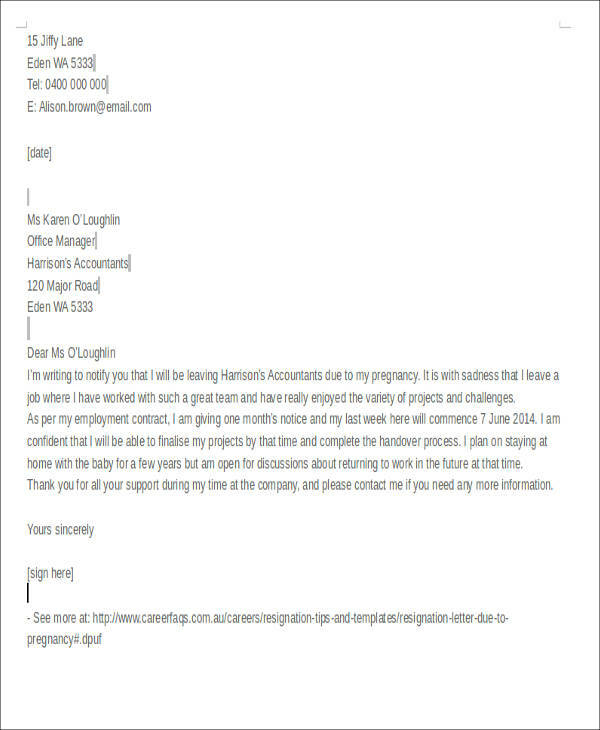 Inform your employer about the circumstances that is part of the reason why you need to leave your job, which in this case is your pregnancy and your plans of taking care of your baby full time. Let your employer know that having the baby will affect the way you do your job. 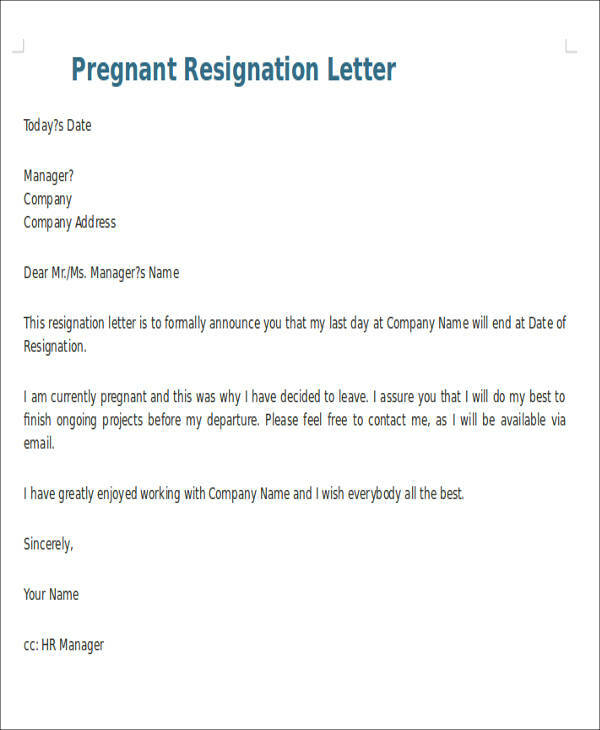 If you have been advised to rest while you are pregnant, present your medical certificate alongside your resignation letter to make your letter more solid. Close your letter appropriately and sign it afterward. You have to consider the choices that have been presented to you such as whether you are open for possibilities of returning once your child is old enough or when you feel like you are ready. They may also offer you to do part-time job while still staying at home. Just remember, you are the one who knows what is best for you and for the welfare of your child. Always try to arrange a meeting with your boss in person if there is a possibility that you can have a one-on-one meeting with your boss. If certain situations make it impossible for you to see your boss in person, explain it to your boss through phone or via email. Let your employer know that the decision that you made was not easy and that it required a lot of thinking as well as a lot of consideration. If applicable, let your employer know that the circumstance that had led you to the decision has nothing to do with the company but more of the fact that you want to mold your family the way you want to and that you do not want to miss any milestones that your baby will go through. Once you have sent your letter and once you are done doing all the necessary tasks related to quitting your job, make sure that you follow up with a phone call and ask your HR manager about the other paperwork that you might need to file. You may also ask about how your last pay will be sent and other benefits that you might be entitled to. First of all, you just need to choose the sample or samples that you want to use as reference/references. Just scroll and check out the preview of the samples and see which one/ones you feel is a good fit for your maternity situation. Click on the DOWNLOAD button or the green button you can find at the right side of the sample below some sample details (File Format and Size). Once you click on green button, it will change into a red (VERIFY) button. Above it will be a text box where you will be asked to type in a captcha. Just follow the captcha instructions and you will be able to get through that part without breaking a sweat. Click on the red button once you are done with the captcha. After clicking on the red VERIFY button, it will now be a red DOWNLOAD button. Click on that button. After clicking, your screen will prompt you that you are about to download a file and you can save it into another file name. Now you have a copy of a sample that you can use as reference. So how do you make use of the sample/samples that you just downloaded? Read through the whole document and review whether it is the one that you would like to use. If you downloaded a sample in Word Document file format (.doc or .docx), you will be able to easily edit the file. If you downloaded a PDF file, you can copy statements that you would like to make and paste it into a text editor application and start supplementing it with your own words. Review your draft and make all the necessary changes and edits. Make sure your letter is free from grammatical errors and misspellings. 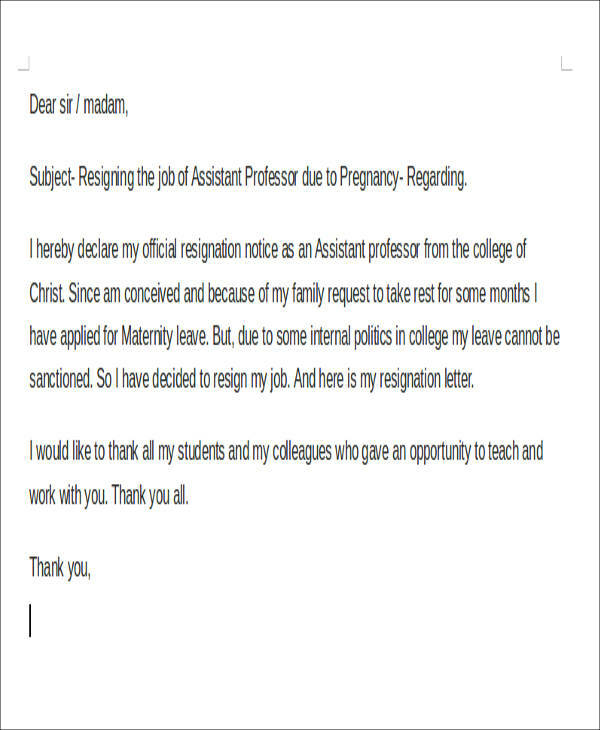 After all the edits, you now have your resignation letter! 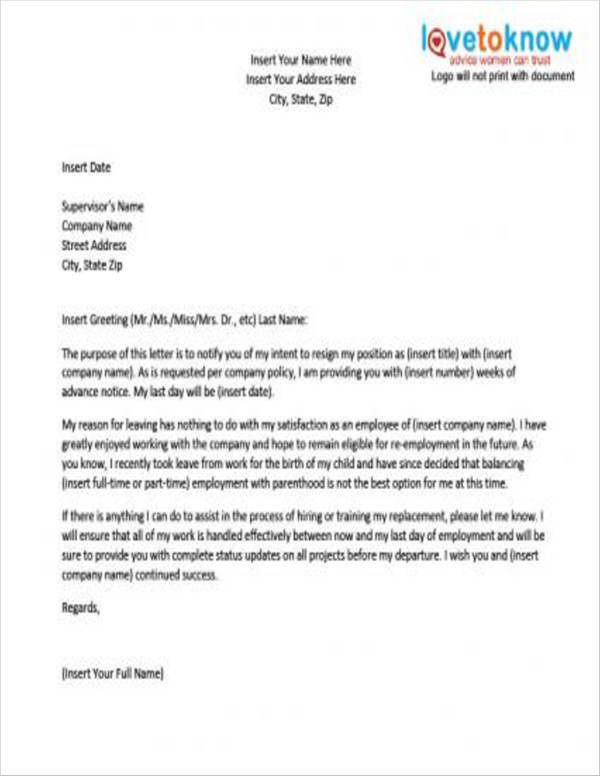 It is time for you to send it to your employer. With the information that we have shared with you, we hope that you picked up a few things that you found useful. We understand that parenthood is quite a task and we wish you and your baby good health.